You Won’t Know This Is So Good For You! When I was still working, a Pho restaurant opened across the road from Harry’s office. My business partner David and I found ourselves eating there almost once a week. 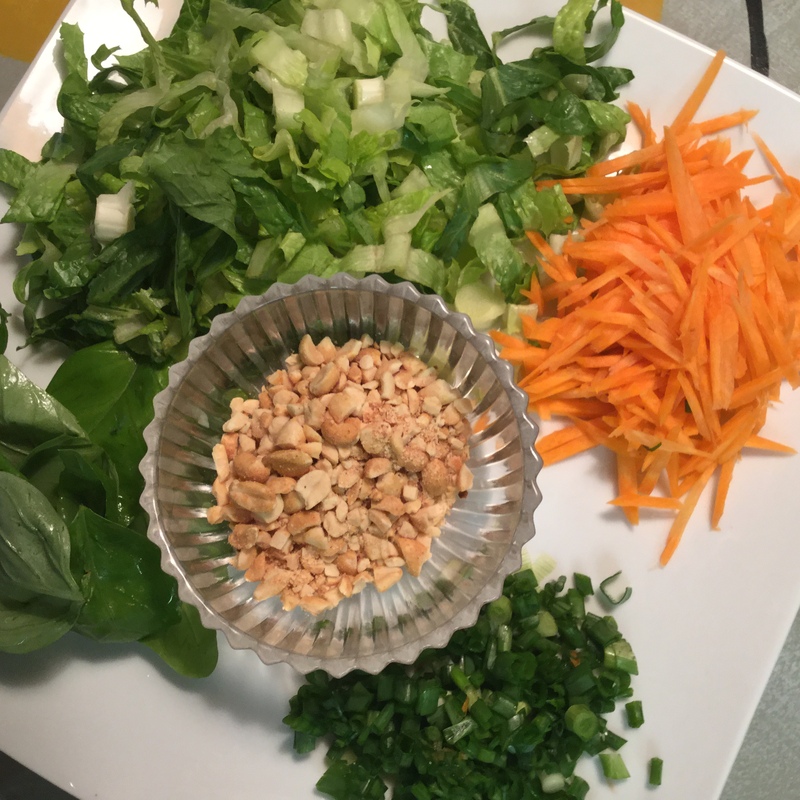 While Harry is not a great friend of Pho, he does love when I make the Vermicelli Noodle Salad. It just happens that it’s very warm today so guess what? I’m making us the salad for lunch. Korean Vermicelli Salad as with much Asian food is very healthy. We just love that we are eating well and enjoying such fabulous tasting food at the same time. This dish relies heavily on fresh produce and today we used what we have on hand. That’s one of the best things about this style of cooking. It can be different each time you make it depending on the veggies or protein that you use. Today we used leftover shrimp. There is no right or wrong! 1/2 cup chopped peanuts or chopped salted Cashews if you have a peanut allergy. We had 6 leftover cooked shrimp from our Garlic Shrimp Dinner, so in they go! Switch it up with other vegetables like: sweet peppers, bean sprouts, snow peas or cucumber. Use whatever you have on hand be creative! Place all the prepared veggies into a mixing bowl. Cook the rice noodles according to the package directions for the brand that you buy. They are not boiled like regular pasta. Rice noodles do not expand like pasta noodles either so you need to start out with approx the amount you intend to add to your salad. When cooked we use 1 cup per person. Cook’s Tip: Buy a medium sized rice noodle also known as vermicelli for this recipe. The very thin ones do not hold up to all the veggies, the very thick ones overwhelm them. 1/2 minced red chili pepper (optional) we like the heat it provides. 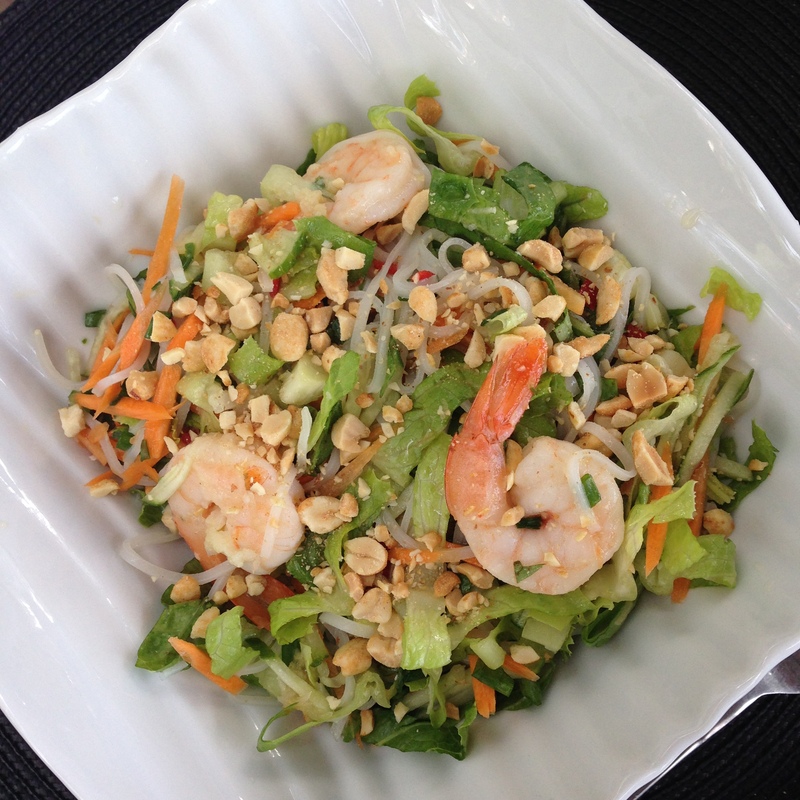 Pour the dressing over the veggies and noodles, toss well and sprinkle with the chopped peanuts or cashews. Al meokkesseumnid! Korean for Bon Appetite! Don’t forget to share this recipe with your friends and family via Facebook or twitter!